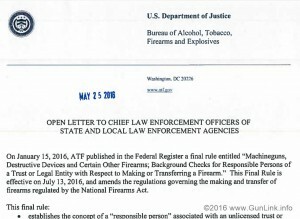 The BATFE recently published an open letter to Chief Law Enforcement Officers (CLEOs) regarding the January 41F ruling (fmr 41P) which makes changes to the way in which NFA applications are handled for legal entities and individuals. The letter goes on to explain that there is no action required by the CLEO upon receipt (or lack thereof) of the paperwork – to include even confirming receipt of the documents. Further, the letter says that it is up to each CLEO to determine how they dispose of or retain (and whether or not they do either). Of immediate concern are several potential issues regarding this lackadaisical hands-off approach to record keeping and privacy mandates. One concern would be with how an applicant would prove that they met the new CLEO notification requirement if there is no acknowledgment of receipt by the CLEO, and what future repercussions might be. Application denials? Revocation of approved applications with forced surrender of the firearms? The ATF has already proven that they are not above such tactics in the recent Form 1 Machine Gun debacles, which are still in litigation. Or worse? The second concern would be how the CLEOs are protecting applicants sensitive information that is contained in the notification paperwork. As the $200 cost associated with making or transferring NFA firearms ($5 for transferring AOWs) is not a fee or a price for goods or services sold but, rather, the tax paid for making or transferring the item, the application could well be considered a tax document. This document details the what firearms are being made or transferred, at which physical address, and – for many applicants – their home address, photograph, fingerprints, signature, and other sensitive information. This information could potentially be problematic if it fell into the wrong hands, which is not outside the realm of possibilities when the CLEO is able to simply toss your notification paperwork into the trash bin for dumpster divers to find or leave it laying around on a desk at the PD for petty crooks to have a look at as they are brought through. As if identity theft wasn’t enough of an issue, without any mandated safeguards on how this information is to be protected, consider the possibility of a motivated criminal coming to Joe Gunguy’s house at 123 Anystreet Lane to steal the expensive 7.5″ Noveske 5.56 AR-15 pattern rifle to use on the streets. If this firearm is so much more dangerous than an off-the-shelf firearm that it requires owners to to register them and pay an extra $200 tax on them and notify the government when we travel with them, does it make sense for the CLEOs to treat the information about those weapons so recklessly? Or is this just another spotlight on the absurdity of the NFA in general? The full text of the letter is here. Further discussion of the open letter to CLEOs is available on Joshua Prince’s law blog.